Its good to see a first hand report on performance in that there are still people who don't think that a one gallon flush is enough -- Todd would strongly disagree (so would I based our our dual flush toilet experience). This is an account of installing the laundry water recycling system from the Homegrown Evolution blog. The system design comes from Oasis Design, which has a lot of information on various types of simple grey water recycling systems, and some good books. These systems allow laundry water which would otherwise just contribute to overtaxing the municipal sewer system to instead by used for landscape watering. Toilets account for approx. 30% of water used indoors. By installing a Dual Flush toilet you can save approx. 40% of water being flushed down the toilet, compared to a standard, modern 1.6 gpf (gallons per flush) model. 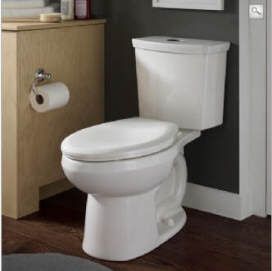 If your toilet has been installed prior to 1994, you are using 3.5 gallons or more each single flush. The water savings you can achieve by upgrading to a Dual Flush toilet are substantial. By reducing your water usage, you are also reducing the cost of your water bill! !